Would you expect retrograde motion for a superior planet to occur, if it does occur, when the planet is near opposition or near conjunction? Why? Would you expect retrograde motion for an inferior planet to occur, if it does occur, when the planet is near opposition or near conjunction? Why? Can an inferior planet ever be in conjunction? In opposition? Why or why not? The problem of the planets was difficult, and Ptolemy warned his readers that he might be forced to use something contrary to the general argument, or to presuppose something without immediate foundation, or to devise different types of models for different planets. He argued that "since the appearances relative to the stars are also found to be dissimilar, one should not reasonably think it strange or absurd to vary the mode of the hypotheses of the circles, especially when, along with saving the regular circular movement absolutely everywhere, each of the appearances is demonstrated in its more lawful and general character" (Almagest, IX 2). Planetary observations compiled by Hipparchus revealed that each planet had retrograde arcs that did not occur with constant regularity around the ecliptic, nor were they uniform in size. The epicycle model, however, produces retrograde arcs all the same size and uniformly distributed around the plane containing the deferent and epicycle. Combining the epicycle and eccentric hypotheses and introducing an eccentric deferent seems, in hindsight, almost inevitably the next step. Although accurate history is not always produced by imagining a logical and possible progression of how science might have developed and then concluding that that is what ancient astronomers did, a plausible case can be sketched. The eccentric hypothesis was the other type of uniform circular motion that could be called on in an emergency. Furthermore, the retrograde anomalies occurred with respect to the ecliptic, and Hipparchus's solar theory accounted for the anomaly of the Sun's motion, also in the ecliptic, by employing an eccentric deferent circle. And, bottom line, an eccentric deferent does produce nonuniform spacing of the planetary retrograde arcs. But the size of all the arcs for each planet is still the same. Something more is needed. Maybe even something not in strict accordance with uniform circular motion. The eccentric hypothesis produces the appearance of greater speed for planets when they are near perigee (the closest point in the planet's orbit to the Earth), and planets consequently traverse their perigee arcs seemingly in less time than the other halves of their orbits. But observations of the planets revealed that the time from greatest speed to mean speed was always greater, not less, than from mean speed to least speed. The epicycle hypothesis, on the other hand, produces the appearance of greater speed at apogee, and correspondingly, the observed phenomenon: that the time from greatest speed to mean speed is always greater than the time from mean speed to least speed. Figure 9.3: Motion at Perigee and Apogee in the Eccentric and Epicycle Hypotheses. left: The eccentric circle ALMPKJ carries a planet with uniform angular speed around its center, C. The Earth is at E. P is perigee, the closest point in the planet's orbit to the Earth. 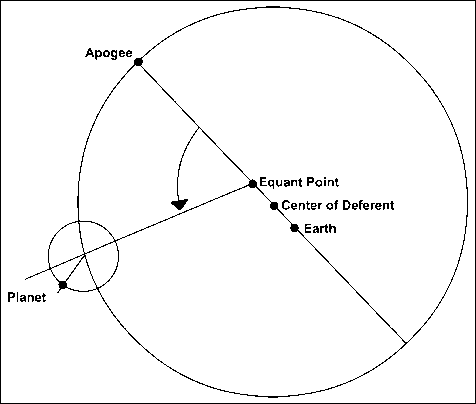 A is apogee, the farthest point in the planet's orbit from the Earth. The planet moves on the apogee arc from J through A to L in the same time that it moves on the perigee arc from L through M and P and K to J. But seen from Earth, the perigee arc LPJ is greater in angular measure than the apogee arc JAL. Thus the planet as seen from the Earth appears to move faster near perigee than near apogee. Mean speed as viewed from the Earth (but understood in this twenty-first-century geometrical construction as the speed that would be viewed from C) occurs between K and J (and also between L and M) at the point that a line of length CJ drawn from E would just reach the circumference of the deferent circle between K and J (and between L and M). The time from greatest speed to mean speed would be the time consumed moving from P to the determined point between K and J, and the time from mean speed to least speed the time consumed moving from the determined point between K and J to A. The time consumed moving from P to anywhere between K and J will be less than the time consumed moving from anywhere between K and J to A. But, Ptolemy reported that in the case of the five planets the time from greatest speed to mean is always greater than the time from mean speed to least. right: In the epicycle hypothesis, the Earth is at E, the center of the deferent circle, which carries around the smaller epicycle, which in turn carries the planet. A and P are apogee and perigee. The rotations of the deferent and epicycle circles are both counterclockwise. When the planet is near apogee, the two circles' motions are pointed in approximately the same direction, and the motions add together to give a greater resulting speed. When the planet is near perigee, the two circles' motions are pointed in approximately opposite directions, and the motions partially cancel each other, resulting in a lesser net speed. 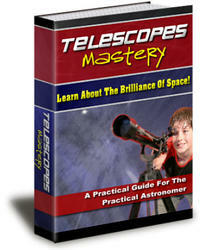 Therefore, in the epicycle model, planets will appear to move faster at apogee and slower at perigee. Figure 9.4: Equant Point. The center of the deferent is midway between the Earth and the equant point. The center of the epicycle carrying the planet travels with uniform angular speed as observed not from the center of the deferent but from the equant point. now measured with respect to points other than the centers of the eccentric circles that carried the epicycles. Ptolemy deemed the equant point necessary to save the phenomena. Fourteen centuries later, Copernicus would condemn the equant point as an unacceptable violation of uniform circular motion. 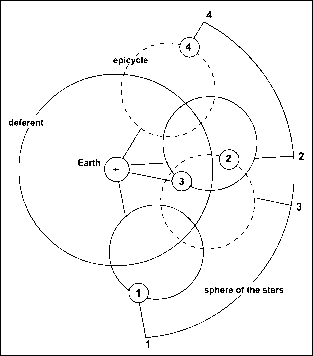 Ptolemy had set out to write the astronomical equivalent of Euclid's Elements, and he succeeded. He showed, for the first time, how to render from observations numerical parameters of planetary models. Unrivaled in antiquity, the Almagest was a brilliant synthesis, combining a treatise on theoretical astronomy with practical examples teaching many generations of astronomers how to construct geometric and kinematic models constrained by astronomical observations. The Almagest reigned, albeit sometimes in absentia, as the major astronomical textbook, surpassing all that had gone before and not itself surpassed for some fourteen hundred years, until the time of Copernicus.